The apartment is located on the third floor of the Residence Marmolada, in Alba di Canazei. Structured on two levels the house is composed of the following areas: on the first floor there is the entrance, with dining room, living room, kitchenette, double bedroom and bathroom with shower; on the second floor two adjoining bedrooms and a second bathroom (no shower). The paneling on the walls, the floor carpeting and the simple furniture make sure that inside the house there is a familiar and welcoming atmosphere. As a mansard the house is equipped with numerous velux windows that make it very bright. On the east and west side there are two wall windows with a panoramic view of the Sasso Piatto-CInque Dita-Sasso Lungo group and the Marmolada. The Residence has a private parking reserved for condominiums. The apartment is particularly suitable for people wishing to share a pleasant experience in the company (groups of young people or families with children). Warning: there are no sheets or towels in the house, while there are blankets, crockery and the main appliances (television, dishwasher, microwave oven, slicer, etc.). Just outside the front door there is a landing, where a private piece of furniture makes it possible to lay down the ski boots, as well as any type of footwear. - is located in front of the Famila store and a few steps away from other services: tobacconist, newsagent, bar, sports equipment rental, etc. 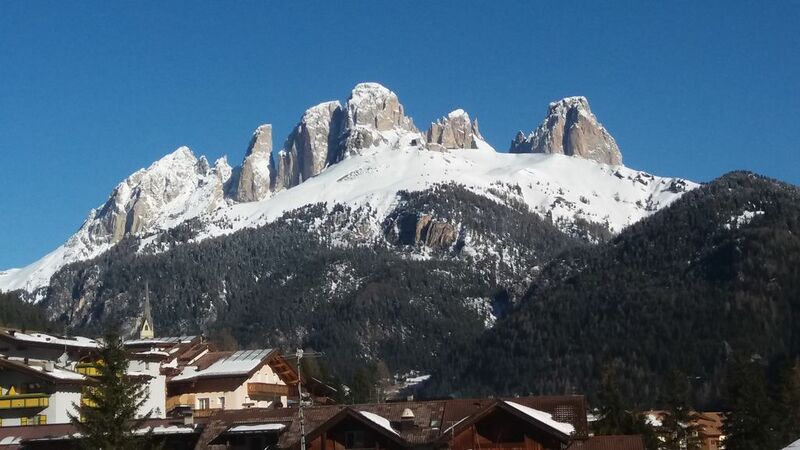 In recent years, Alba, as a fraction of the famous tourist resort of Canazei, has been chosen as a privileged outlet for the development of the city center now full of services. The lifts are among the most renowned in the world for connections and technological upgrades.